Until the 1980’s our eastern Juniper Hairstreak was called the Olive Hairstreak, and placed in a separate genus, Mitoura, along with Hessel’s Hairstreak, our other greenish, cedar-feeding hairstreak. But Juniper/Olive Hairstreak was shown to interbreed and have intergrading wing patterns with western forms of Callophrys, and was reclassified as part of that large genus (Robbins 1994). However, recent allozyme analysis shows our eastern form to be quite distinct from western forms (Pratt et al. 2011), and it is now usually referred to as a sub-species, Callophrys gryneus gryneus (Pelham 2008). Scudder called it Mitura damon. 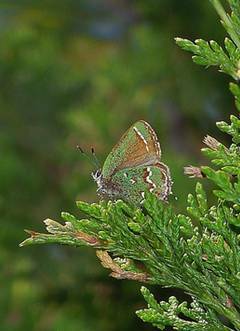 Today, Juniper Hairstreak is one of those perplexing species which is much less common than its host plant here. Thaddeus W. Harris was the first to report Juniper Hairstreak from Massachusetts. He proposed to call it the Auburn Thecla (Thecla Auburniana), “from a favorite spot near Cambridge, formerly known by the name of Sweet Auburn, where I have repeatedly taken it before the place was converted to a cemetery.” (Today this is Mount Auburn Cemetery.) Harris found “this pretty species” on “the mouse-ear (Ghaphalium plantagineum) in May, and on the flowers of the spearmint in August,” thus implying that it had two broods (Harris 1862: 277-8; Index). Harris' 5/1831 and 8/1833 specimens are in the Harris Colln. and the Types Colln. #26346 at the MCZ. Scudder (1889: 866) tells us that the plant Harris refers to is Antennaria plantaginifolia, or pussytoes. Scudder believed that Juniper Hairstreak occurred in only the southern part of New England, and “seldom in any great abundance.” Its most northern known locality in 1899 was the vicinity of Boston (Scudder 1889: 865). Today, Juniper Hairstreak is listed as possibly extirpated in New Hampshire, and S1 or “critically imperilled” in Maine (NatureServe (3/2011). The Maine Butterfly Survey has recent records from only two townships in the southern tip of the state (MBS 2011). Therefore, Juniper Hairstreak in Massachusetts is still near the northern edge of its east coast range, as Scudder thought a century ago. Harris' six syntype specimens in the Harvard MCZ are the earliest, dated 5/1831 and 8/1833, one marked "Blue Hill" (Harris Index). In 1899 Scudder reported that around Boston Juniper Hairstreak had been found in West Roxbury (two W. Faxon specimens are in MCZ), Hyde Park, Dorchester (where it was “quite abundant”; two Scudder specimens from Jamaica Plain in MCZ), Lynn, Quincy, Wyoming (in Melrose near Middlesex Fells), Cambridge, Milton, Blue Hill, and Walpole (1899: 865). Avid collector F. H. Sprague took specimens in Wollaston (Quincy) in 1878 on 22 May, 29 June, and 3 July (Sprague 1879; one July 3 specimen in MCZ). Many specimens from the 1880s and 1890s are in the Harvard MCZ. Sprague collected Thecla damon again in Wollaston in May 1896 and 1897, and C. Bullard collected at least six in Waltham in May and June 1897. Early specimens from Malden, Medford, and Sherborn are at Boston University. It is instructive to realize that because of rampant suburbanization, Juniper Hairstreak cannot be found in most of these locations today. Juniper Hairstreak had also been found in western Massachusetts at the turn of the century, at Springfield, Mt. Tom (in Easthampton), Holyoke, and in the Holyoke Range (Scudder 1889:865; no specimens found). By 1939 it had been collected in Granby (3/30/1939, H. L. Johnson, Yale). Habitat for this species probably expanded between 1600 and 1850, as a result of land clearing, grazing, burning and timbering, and also after 1850, as re-growing old fields sprouted young juniper trees when agriculture began to decline (Table 1). By 1934 Farquhar, who reviewed the status of lepidoptera in New England, is able to list more locations, further from Boston, where Juniper Hairstreak had been collected: Framingham, Marblehead, Salem, Middleton, Stoneham, Weston, and Dover. By 1939 it had been collected in Swansea (Bristol Co.) (11 May 1939, Yale). However, it most likely was not present on Martha's Vineyard or Nantucket in the early 20th century, since the definitive work by Jones and Kimball (1943) makes no mention of it. Nor do there appear to be any historical specimens from Martha’s Vineyard or Nantucket in the Harvard MCZ, the Yale Peabody Museum, or at Boston University. From 1935 through the 1960’s and 1970’s, there are a few reports and museum specimens, but not nearly as many as for the more common hairstreaks such as Banded Hairstreak and Striped Hairstreak. For Cape Cod, four specimens from Barnstable 1958-1964, taken by C. P. Kimball and now in the MCZ, finally document the species’ presence there. North of Boston, James P. Holmes found a colony in Essex in 1966, adding to the known locations in Stoneham, Middleton, Salem and Marblehead. West of Boston, Edward M. Peters found it in Carlisle in 1971. South of Boston, William D. Winter reported “an extensive colony” in Needham on eastern red cedar in an old field in the mid-1970’s, observing it in both broods (two 7/28/73 Babson Park specimens in the MCZ; other specimens at Yale). He also found it in Dover (1966) and Medfield (1976). In 1972, E. Peters found Juniper Hairstreak in May in Framingham on lilac, and remarked that it was a good year for all hairstreaks, as was 1973, according to many observers. But in 1974, D. Willis reported Juniper Hairstreak as “way down in both spring and summer broods” as compared to 1973 in the Holliston-Sherborn-Framingham area. In the Connecticut valley in 1973, P. Carey reported that “the colony of M. gryneus at South Hadley-- in the meadows located west of North Main Street --showed well in both broods” (Lep.Soc. Seas. Sum. and Corresp. 1959-1981). Despite all these reports, Juniper Hairstreak seems to have remained uncommon, and probably was negatively affected by the loss of old field habitat (Table 2). The Connecticut Atlas also found eggs on this plant in the wild (O’Donnell et al., 2007). Females apparently will not oviposit on Atlantic white cedar (Chamaecyparis thyoides) although the larvae develop normally on it when transferred (Opler and Krizek 1984: 97). The butterfly may be present wherever there are stands of red cedar, usually dry, open, second-growth areas, including fields, slopes, and coastal locations. Extensive stands do not seem to be required; the butterfly has been found in clusters of only a few trees. In Massachusetts today, stands of red cedar are often found on rocky hilltops or ridgetops. Where such areas are surrounded by dense suburbs, as at Horn Pond Mountain, Woburn, they act as refugia for many hairstreaks. Stands of red cedar are widespread in eastern Massachusetts, but there is much seemingly suitable habitat in which the butterfly has not been found despite searches. Scudder found this species uncommon in 1900, and it remains so today. The 1986-90 MAS Atlas confirmed Juniper Hairstreak in only 37 of 723 blocs searched; that ranks it as “Uncommon.” MBC sight records from 2000-2007 also rank it as Uncommon (Table 5). Many other hairstreaks and elfins---Frosted Elfin, Eastern Pine Elfin, Brown Elfin, Banded Hairstreak, Edwards’ Hairstreak---were seen more frequently in this period, with the same amount of total effort. Cassie in the Atlas account termed Juniper Hairstreak “quite common in eastern Massachusetts,” but that could not be said today, as this species is rather hard to find. There is a somewhat cyclical pattern of MBC sightings per total trip reports (Chart 30). The pattern might reflect normal fluctuations in population numbers. No long-term trends should be inferred. A thorough list-length study using MBC data found a 19.0% decline in detectibility of this species 1992-2010, but it was not statistically significant (Breed et al. 2012). In this species population outbreaks and declines are often quite localised. As Mello and Hanson put it, Juniper Hairstreak can be “sporadic in abundance and distribution....common at a given site one year and absent the next (2002:39). In 2000, especially high numbers were reported from both Martha’s Vineyard and the Amherst area. On the Vineyard, 27 were reported from Oak Bluffs on 5/6/2000 (M. Pelikan), as well as 24 on 8/6/2000 from the second flight. In Amherst, 47 were reported on 5/14/2000 (T. Gagnon) for the first flight, and 20 on 8/6/2000 (D. Minear) for the second flight. In 2004, 39 were reported on 5/17 in Amherst (D. Minear), but other than that, no reports from Amherst in prior or subsequent years exceed single digits. It seems that 2000 and 2004 were good years for Juniper Hairstreak in these two locations. 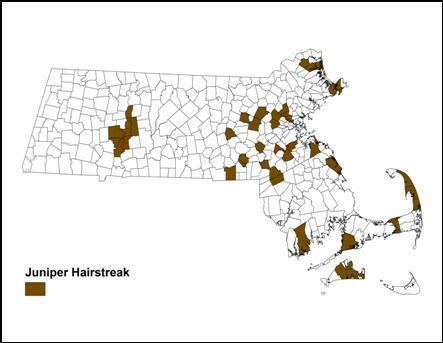 BOM-MBC reports 1991-2013 (Map 30) show that Juniper Hairstreak is found in only two regions: (1) eastern Massachusetts from Essex County in the north to Martha's Vineyard in the south, and (2) the lower Connecticut River valley. In this period it was found in no central Massachusetts towns west of the Worcester area (the westernmost towns being Northborough and Uxbridge), and not at all in Berkshire County. The 1986-90 MAS Atlas found a very similar distribution, except that it did not find it on either Martha’s Vineyard or Nantucket. Juniper Hairstreak was found in 41 out of 351 towns in these years; this compares to 126 towns for Banded Hairstreak and 109 for Striped Hairstreak, and is similar to the 41 towns for Acadian Hairstreak. The first known reports from Martha's Vineyard came in 1998; before that, there had been no Atlas or historical reports from either that island or Nantucket. Juniper Hairstreak was probably a new arrival to the Vineyard in the 1990's. As Matt Pelikan put it in his report in Massachusetts Butterflies, the Vineyard's agricultural economy was declining, and red cedars were among the first trees to colonize abandoned dry farmland, soon becoming abundant on the island (Pelikan 1999). Pelikan reported 1-6 individuals at several spots around Oak Bluffs that year, especially a small stand at Trade Winds with "only a handful" of cedars. Vern Laux, Allan Keith, and Alison Robb also reported the species from the Vineyard that year. The species flew from early May to August 7, 1998, the second flight and the 5/9/1999 reports being evidence of successful reproduction on the island. A few years later, the Martha’s Vineyard checklist (Pelikan, 2002) ranked Juniper Hairstreak as “common” on the island. It continued to be reported in good numbers through 2008, but subsequent years saw some decline, either because of reduced observer effort or possibly increased residential development reducing the "old field" habitat. MBC still has no reports from Nantucket (LoPresti 2011). Juniper Hairstreak is most often seen in ones or twos, and only occasionally in larger concentrations. The highest recent counts have been from two locations, one in the east -- Hingham World's End TTOR, 42 on 8/5/2013 G. Dysart and B. deGraaf -- and one in the west -- Holyoke Dinosaur Footprints TTOR, 41 on 5/15/2009 T. Gagnon et al. Other locations from which larger numbers have been reported are Canton Great Blue Hill max. 7 on 7/26/2008 E. Nielsen; Easthampton Mt. Tom State Res., max. 55 on 5/15/1999 T. Gagnon; Lexington Cedar Hill and Juniper Hill max. 8 on 5/23/2004 T. Whelan; Medford/Winchester/Stoneham Middlesex Fells, 3 on 5/7/2013 M. Arey; Oak Bluffs (var. locs., incl. Trade Winds, Farm Pond ) max 27 on 5/6/2000, M Pelikan; Wellfleet Wellfleet Bay WS, 6 on 5/1/1999 A. Robb et al., 5 on 7/27/2013 M. Faherty et al. ; and Woburn Horn Pond Mountain, max. 5 on 5/19/2003 B. Bowker. For Cape Cod, Mello and Hansen (2004) say that Juniper Hairstreak is reliably present at Wellfleet Bay Wildlife Sanctuary, is frequent around cedars in North Truro, and sometimes found at Crane WMA in Falmouth. It has been found quite frequently in the Foxborough area (25 on 5/2/1998, B. Cassie), and on the Northampton NABA Count. NOTE TO COLLECTORS: THIS IS AN UNCOMMON AND POSSIBLY DECLINING SPECIES IN MASSACHUSETTS. PLEASE REFRAIN FROM COLLECTING SPECIMENS EXCEPT FOR THE PURPOSE OF SCIENTIFIC RESEARCH UNDER INSTITUTIONAL AUSPICES. Juniper Hairstreak has two broods in Massachusetts, an adaptive flexibility which apparently has not helped to make it more common here. According to MBC 1993-2008 records, the first flight takes place about mid-April through the end of June, and the second flight from mid-July to mid-August (http://www.naba.org/chapters/nabambc/flight-dates-chart.asp). On a statewide basis the end of the first flight is quite close to the beginning of the second flight, so that an observational data series from a single location would be desirable to better specify the dates of the two flights. Flight Time Advancement: In comparison to Scudder’s reports over a century ago, Juniper Hairstreak’s first flight dates seem to be getting earlier, although a rigorous study remains to be done. Scudder’s flight time observations usually applied to the Boston area. He wrote that “This insect is double-brooded, the earliest butterflies appearing about the first of May – sometimes not until the 7th or 10th; they become abundant by the 15th or 20th and continue on the wing throughout June. .... second brood appears about the 20th of July, and continues into August, much less abundant than the first...(1889:866). He noted that some chrysalids from the first brood remain unhatched until the following spring. If this is still so, the second brood would therefore be only a partial brood. The earliest MBC dates for the first flight are markedly earlier than those reported by Scudder, or by the 1986-90 Audubon Atlas. Earliest Sightings. In the 23 years 1991-2013, the seven earliest "first sightings" of Juniper Hairstreak were 4/13/2012 Woburn HPM H. Hoople, 3,photos; 4/18/2009 Sherborn power line, B. Bowker; 4/20-21/2010 Woburn HPM., M. Arey, S. Moore, H. Hoople; 4/21/2002 Oak Bluffs, M. Pelikan; 4/27/2013 Woburn Horn Pond Mtn. H. Hoople, photos; 4/29/2000 Norfolk, B. Bowker; and 4/30/2001 Oak Bluffs, M. Pelikan. All these were in April; in the other 16 years the first sighting was in May. The Lepidopterists’ Society reports 4/25/2009 Woburn Horn Pond Mtn. M. Arey as an early date (Seas.Sum. 2009), but it is not the earliest. The Audubon Atlas early date had been 5/2/1987, Middleboro, K. Anderson. After early sightings in 2009 and 2010, 2011 was a poor year for Juniper Hairstreak in eastern Massachusetts, and there were no April sightings at the usual spots --Great Blue Hill, Horn Pond Mountain or the Vineyard. But the warm winter and spring of 2012 set new early records for several species, including Juniper Hairstreak. Second Flight. In the Atlas period the ‘extreme date’ for the beginning of the second flight was 8/2/1986, Granby, and the second flight was said to take place only in August. But 1993-2008 MBC records show that the second flight begins about mid-July (see flight chart), which accords with Scudder's observations. In 2013 the second flight was first reported on 7/12/2013 at Woburn Horn Pond Mt. (photo by H. Hoople at http://www.flickr.com/photos/hghoople/9268646445); in 2012 it was first reported on 7/17/2012 at Canton Great Blue Hill (photo by G. Dysart at http://dysart.zenfolio.com/junipers); and in 2011 it was reported from Wellfleet Bay WS on 7/23/2011 by M. Faherty. In 2008 Juniper Hairstreak was flying on 7/19 on Martha's Vineyard (NABA Count), and at Great Blue Hill on 7/26, but in 2009 and 2010, the second flight was not reported or documented. Latest Sightings. In the 23 years 1991-2013, the four latest "last sighting" dates marking the end of the second flight are 8/19/2003 Dennis, T. and C. Dodd; 8/19/1999 Amherst, D. Case; 8/17/2000 Oak Bluffs, M. Pelikan; and 8/10/2013 Oak Bluffs, M. Pelikan. These dates accord with the Atlas late date of 8/18/1989, South Hadley, T. Fowler. The mid-August ending of the flight does not appear much changed since Scudder’s report in 1899. Juniper Hairstreak warrants concern and conservation attention in Massachusetts, despite its present conservation ranking as S4 or “apparently secure.” To our north, as mentioned above, this species is possibly extirpated in New Hampshire and S1 or “critically imperiled” in Maine (Nature Serve 2/2011). Juniper Hairstreak is thus near the northern edge of its east coast range in Massachusetts, as Scudder noted a century ago. The situation to our south is not hopeful. The 1990-95 Connecticut Atlas found only 28 project specimens, compared to 146 pre-project specimens, and concluded that Juniper Hairstreak was “losing ground in the state” because of habitat loss (O’Donnell et al. 2007: 293). Habitat for Juniper Hairstreak declines as old fields mature and early successional areas grow into forests. This species is not found in the western, heavily forested areas of the state, where red cedar is scarce. Both the MBC and the Atlas distributional maps demonstrate that this species is not distributed throughout the state--- which is the impression given by more broad-scale published distribution maps (Opler and Krizek 1884; Cech 2005)--- but concentrated in the east and the lower Connecticut River valley. Loss of habitat may be the most important threat to this lovely, uncommon hairstreak, but even where red cedar is common there is much seemingly suitable habitat where the butterfly has not been found despite searches (cf. Cech 2005). More research into precise habitat needs and temperature tolerances seems necessary. Since Juniper Hairstreak presently ranges south to north Florida, it is not a priori expected to be adversely affected by climate warming in the northeast.